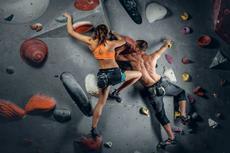 Rock climbing is a physical, mental and technical sport. The good news for enthusiasts who don’t like to work out is that they don’t have to and can still be good at climbing. Active people have many options if they ever decide to ditch the boring gym and expend their horizons when it comes to fitness. Climbing facilities are ideal for fans of the outdoors who happen to live in a city. Many people have picked the recreational sport as an alternative to working out. While it may not be the best option for people who are afraid of heights, it definitely is a killer workout. Climbing will challenge your strength and stamina—maybe even your bravery, too. The average person can burn anywhere from 750 to almost 1,000 calories in an hour, at high intensity, with minimal rest. Gyms are great places not just for getting fit. They are an awesome arena for socializing because you make new friends and meet fellow climbers and people with similar interests.